Bless this mess....: ...and a belly button, too!!! ...and a belly button, too!!! Well...Allison is well on her way to a career as an artist. 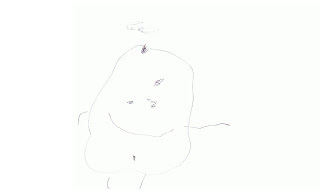 Her artistic skills rival those of her older sisters, when they were 2 (almost 3) years old. As you see here...this is a person. Complete with arms and legs....and a belly button, too. She was quick to point this out to us. The stuff at the top of the person is it's hair. She must be basing this look on her mom's hair-do (or don't) first thing in the morning. If she draws something for you, someday. Save it. It will be worth millions. Eventually. Amazing! She really is gifted! that is the sweetest thing! i keep every scrap of anything my son creates. i just can't part with any of it!